Shepherd's English monster is a being that has no conscience, no soul. In Jewish lore such a creature is called a golem. It has the appearance of a man but is a nonhuman creation brought into being by magic. Both the concept and the word date back to the Old Testament and the Talmud (the book of Jewish law). The word is variously translated as "unformed," "imperfect" and "shapeless mass," and is often used to indicate a clumsy and brutish being. Before he was infused with a soul, the Talmud (Tractate Sanhedrin, Folio 38b) describes Adam as "kneaded into a shapeless husk" of dust - in essence, a golem. The idea of a golem, or a monster with superhuman strength that could be conjured and ordered to do one's bidding, has held certain appeal throughout history - in particular for Jews who saw such a creature as a defender against those who would persecute them. Thus in the Middle Ages when rumors held that Jews murdered Christian children, using their blood in Passover rituals, the golem was resurrected, so to speak. According to legend, a rabbi (or three, depending on sources) was instructed to create a being using fire, water, earth and air. The rabbi could then command this "mud-man" to defend the Jewish community from its attackers. The creature performed accordingly but often ran amok, killing innocent people, and had to be destroyed. It's easy to see how the notion of such a creature could ignite the imagination of a writer. Indeed, the golem has left a mighty and varied legacy within the literary arts. Probably the most famous is Mary Shelley's Frankenstein. A creature, assembled from salvaged parts, is created with ostensibly noble intentions but, through no fault of its own, maliciously turns on its architect. More recently is the children's book - a cautionary fable - called simply, The Golem by Nobel Prize-winning author Isaac Bashevis Singer. Another, even more recent novel is Michael Chabon's 2001 Pulitzer-winner, The Amazing Adventures of Kavalier and Clay, in which the partners create a number of monsters. 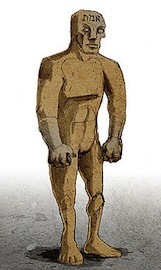 The golem has also made its way from page to screen, both big and small, not just via Frankenstein but in the 1920 horror film entitled The Golem (Der Golem, wie er in die Welt kam). There is also Pete Hamill's Snow in August, about an unlikely friendship that turns to magic then all goes horribly awry. Additionally there's the 1967 B-movie It! starring Roddy McDowall, featuring a reincarnation of the 16th century monster. And it has even been speculated that the comic-book creature, The Incredible Hulk, is a golem. Click on the video below to watch the 1920 film The Golem in which a 16th century rabbi makes a giant man-creature and brings it to life in order to protect Jews from persecution in Prague. This "beyond the book article" relates to The English Monster. It first ran in the July 25, 2012 issue of BookBrowse Recommends.